While many people still consider the Renaissance to have been a movement created largely in Florence and Rome, in recent decades this understanding has been changing. The Renaissance has become more international and its chronology has become wider, one might even say less clear-cut, than it used to be. If one looks at the specifications of societies and international conferences concerned with the art and history of the Renaissance, one may find that these days the era runs from the 1200s all the way to the Enlightenment. Both ways of looking at the Renaissance have their advantages: the more restrictive one of a Florentine Renaissance taking place during (mostly) the fifteenth century teaches the beholder to view works of art with greater focus, in detail, concentrating on characteristics particular to this time and place. The wider understanding of how such characteristics may have travelled or perhaps even originated elsewhere – at least in part – provides the greater geographical context and the extension of the narrow time frame helps to follow artistic development before and after the traditionally set period. Every so often, it allows for a glimpse at just the moments when changes and developments happened. In Florence, Palazzo Strozzi is an exhibition space in which to learn from (sometimes unusual) juxtapositions. The palace stages major exhibitions on a regular basis, not all of which concern renaissance art. But, even when the exhibitions study the work of an important fifteenth- or sixteenth-century artist or attempt to place the works of art in their societal and political context, one can expect to be surprised – not least, since there are always freshly restored works on display. 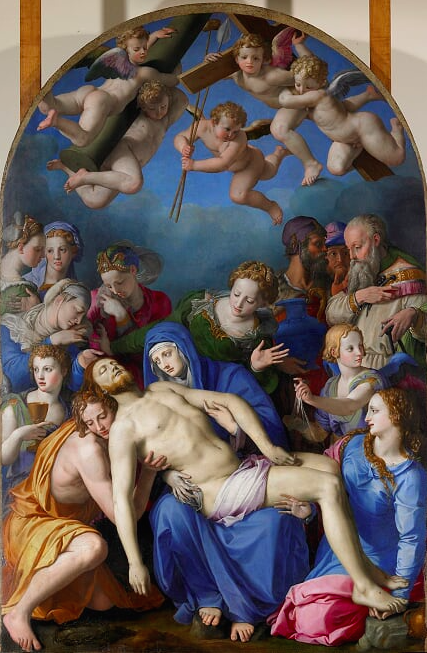 The current show at Palazzo Strozzi concerns sixteenth-century art in Florence from the 1520s onwards. It follows two previous exhibitions with a focus on Agnolo Bronzino (2010) and on Pontormo and Rosso Fiorentino (2014) respectively. 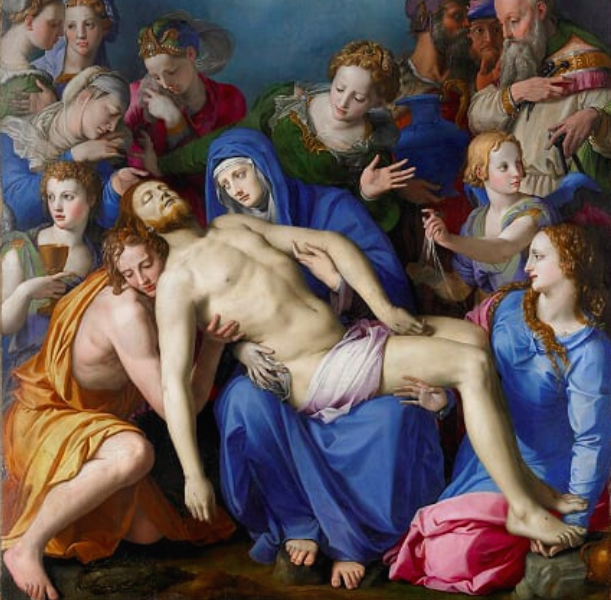 Antonio Natali (former director of the Uffizi Gallery, Florence) and Carlo Falciani (Accademia di Belle Arti, Florence) curated all three of these with a special focus on mannerist art. Often overlooked or even regarded as some kind of artistic mistake placed between the oeuvres of Botticelli, Raphael and Michelangelo on the one side and the dawn of the Baroque on the other, during recent decades Mannerism has finally received the attention it is due. 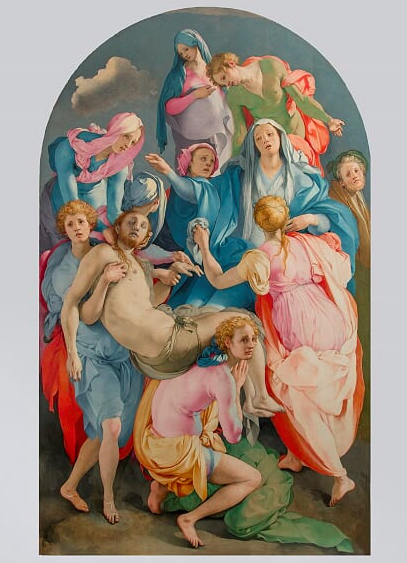 Not least, the exhibitions on Agnolo Bronzino or on Pontormo and Rosso Fiorentino presented the creations of these artists as part of their multifaceted personalities rather than “simply” in the tradition of Michelangelo’s work. Supplementing the exhibitions of figurative art normally distributed over so many different sites, including galleries, museums and churches, with examples of poetry or with contemporaneous judgements on the works displayed, certainly helped to see the unusual degree of modernity achieved by them. Indeed, the third and final exhibition in the series consists of eight rooms, the first two of which take the spectator back to the previous displays. Works of art not shown in 2010 and 2014 act as reminders of the artists. Michelangelo as a model for his fellow artists is represented by a River God (1526-27, left unfinished and newly restored). While the first room concentrates on art created during the 1520s, when Italy and many other parts of Europe were torn apart by wars and suffered the impact of the Reformation, the second and third take the spectator further towards the middle of the century, when in Florence the rule of the foremost sponsors had become more settled. In 1539, Duke Cosimo I de’ Medici had wed Eleonora of Toledo in a highly successful dynastic union. The ducal couple produced the required number of heirs and their court artists received commissions for the palazzi and churches in Florence. Although the impact of the Counter-Reformation (room 3) could be felt in art and architecture, it only seemed to spur on the efforts made by mannerist artists to create, for example, altarpieces in keeping with the new rules that also incorporated the removal of the rood screens in churches. As for non-religious art, these same artists also worked for the court and created portraits (room 4) and studies (room 5), in particular the very sophisticated Studiolo for Francesco I de’ Medici. Botticelli’s famous paintings of the Birth of Venus and La Primavera (Uffizi) attest to fact that mythological themes had long been appreciated by Florentine patrons and almost a century later erudite allegories were still going strong (room 6). Finally, the two last rooms take the audience into the next century by means of a forecast into Baroque art (rooms 7 and 8). What is new during the Cinquecento is the debate, oral and written, about art and culture. In Florence, several Academies were founded – often under ducal patronage – and the artists who became members were expected to follow ducal expectations. Cosimo I’s cultural and religious politics underwent several changes during his rule and his ambitions for his family and for his territory meant that he needed to broadcast these politics in Florence, Rome, Spain and the Empire. Important instruments to do so were offered by the writings of Florentine and Tuscan humanists, in particular Giorgio Vasari, author of the Lives of the Most Excellent Painters, Sculptors, and Architects, who also worked at the Medici court as artist and artistic director from 1555. If Vasari’s diverse functions kept him busy right up to his death and to that of his main patron Cosimo, the new generation of patrons (e.g. Grand Dukes Francesco and Ferdinando) and artists (e.g. Giambologna) had learned from their respective role models. Moreover, each of Cosimo’s sons brought his own specific personality and attitude to cultural politics and to how to use it to his greatest advantage. Such preferences led to a changing cast of court artists as well as to the gradual rehabilitation of some artists (e.g. Baccio Bandinelli) who had enjoyed ducal favour earlier in the century. Both exhibition and catalogue cleverly create bridges between the different themes and artistic periods by placing the works of art, their contexts and messages in a kind of dialogue that helps to cross thresholds while still being able to engage with the narrative of an artistic style developed over the course of a long century. 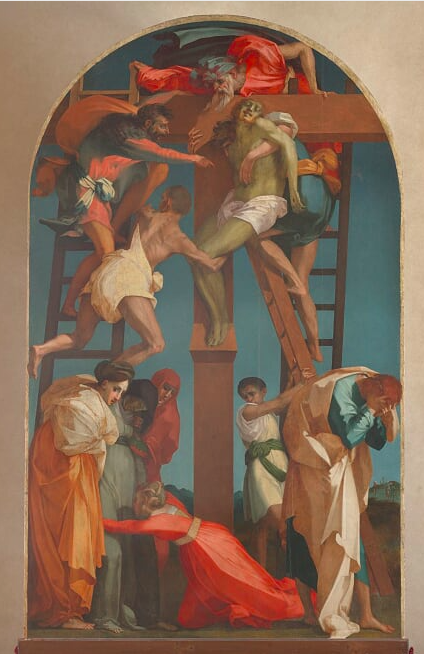 A particular example is that of the three altarpieces between section one and two with the Volterra Deposition from the Cross by Rosso Fiorentino (1521), Pontormo’s Deposition from Santa Felicita (1525) and Bronzino’s Deposition of Christ (c.1543) from Besançon. While the exhibition sets out the complicated issue of art in the service of a developing court often in contrast with others, such as the Catholic Church and the Empire, but also with many communities and families within Tuscany, the catalogue deepens the understanding of the mechanisms leading towards the establishment of institutionalised Medici rule during a time of political and religious upheaval in Florence and Tuscany. Copyright © 2019 Electrum Magazine. All rights reserved.